Facebook has quickly become one of the key channels to further market your brand. With over 50 million businesses currently active on the channel, this is definitely the place to be if you’re a business owner! 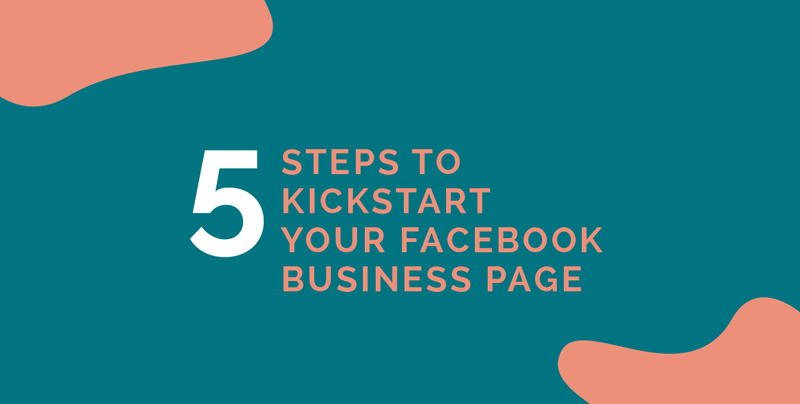 We know that starting out with social media can be an intimidating place to be, which is why we have put together 5 easy steps to kickstart your Facebook Business Page. A Facebook Business page is a one-stop destination for customers who search for you on the social network. Ideally, your page should mimic the look and feel of your website. If you don’t have a website set up just yet, this will be the focus platform where potential customers will be engaging with your brand. While you’re likely to understand why a Facebook Page for your business is important, it’s also critical to know how to build one from scratch, the right way! • Begin with detailing what type of business page you’ll be creating on the Create a Page site. This is where you will select a category that best speaks to your type of brand. • Once you have selected a category, enter your brand’s name, a description, and your website URL. We suggest that you keep your URL short and representative of your brand, avoid characters or numbers that would make your business hard to search for. • Facebook gives you the opportunity to choose your preferred audience. This will give your page a jumpstart as you will be targeting potential customers here. Now, this is where the fun begins! • Upload a profile and cover photo that matches your brand’s personality. Make sure you know the right specs and image size guidelines so you can resize your images to fit perfectly. • Choose a call-to-action to link visitors to your website or any preferred point of contact related to your product or service. • This is an important step to focus on! When updating your about section be sure to add your web URL, a description, your hours of operating, address, a phone number, and email so that your customers can easily get hold of you. One of the worst things you can do as a business is to leave an unfinished Facebook Business Page. While you think it might not hurt to leave up an unattended or half-filled page, it actually does damage to your credibility. • Next, you will want to edit your page settings. Make sure that your page visibility is set to “Page Published” before you start to promote. You have the choice to allow users to send personal messages to your page, we suggest that you keep open lines of communication wherever possible on your channels to seem more humanistic. For your page to truly be successful, you should be focusing on ways to grow your presence with the right audience in mind. First, you will want to set goals for your Facebook Audience. This is where it gets a bit tricky! While it only takes a second to like a page, getting people to trust your brand is a whole other story. We find that one of the best ways to get people to follow you is by being a trusted resource for content. • Ok, so you’re set up with a Facebook Business Page, now what? We recommend starting off by posting anywhere from 3-5 pieces of engaging content introducing your brand. As users begin to visit your page, you want to have a good introduction. • Now is the time to start a schedule. You don’t want to overwhelm your new audience, start off by posting up to 3 times a week with a mix between lifestyle and promotional focused posts. One of the most common mistakes newbies make is spending too much time focusing on selling their offerings. Ease into it, users will appreciate not being spammed by the already overcrowded promotional content out there! • For an extra little boost, start searching for industry leaders in your field. Search related topics and select “people” to see who the experts are and don’t hesitate to send them an invite to your page. Once you do this, it’s likely they will follow you back. Want to know the best part? Their audience will start to follow who they follow, in turn making you a hot option! • Set goals and stick to them. It’s all about consistency! At first, it will be a trial and error process with the type of content you will be putting out there. Notice the content that gets the most engagement and focus on this! If you continue to publish great content on your Facebook Business Page, your audience will only grow. The need for engagement is real! You have to be present on social media and be willing to engage with your audience. Your focus should be on creating long-lasting relationships. • Show your personality! Everything you post about your business on Facebook should portray your brand’s personality. This is the driving force behind why people choose to follow a brand. Although a brand’s content may be interesting and educational, what really gets people to become engaged is a relatable personality. • Get involved with discussions in related groups and be active in your industry. Customers will see and respect that effort from your brand. • We recommend downloading the Facebook Pages App, this will save you heaps of time when it comes to sifting through your notifications and making it really easy to respond promptly. • Facebook records your customer response rate which is shown publicly on your profile. It’s important that you keep that response rate up to maintain a good reputation! The last thing you want is for your customer to approach a competitor because you didn’t take the time to respond to them. Plan your content ahead of time so that you have plenty of posts for the future, this is a huge time saver! Buffer is a great social media management platform that allows you to manage all your social accounts from one simple dashboard. • Contests are a great way to help build your audience from the ground up and get your name out there. Be sure to read up on the most recent Facebook Contest Rules to avoid spending time on a post that could risk being taken down. • Video content is gold! Give customers coming to your site a highly-engaging visual piece of content to discover when they land on your page. • User-generated content is a great way to build trust and influencer relationships. Ask your audience to send you content related to your product or service, repost this and watch the followers start to roll in! • Source or create engaging posts with photos that ensure you stand out from the rest. Avoid boring standard text-only posts that will most likely get lost in the social sphere. Posting your own content is preferred, but if this isn’t an option, you can source beautiful high-quality images from sites like Fotolia. • Being consistent in your post frequency is really important. This promotes credibility and in turn, allowing you to build long-lasting relationships with your audience. After fully setting up your Facebook Business Page and creating engaging content, it’s important to track your efforts. We recommend using the Facebook Insights Tool. It measures the effectiveness of your content, engagement, and how many followers you have gained over time. This will give you rich insight into where improvements can be made, encouraging you as a brand to take an active approach on social media. Now that you have some insights on how to create a page, what content you need and how to measure your efforts, it’s time to get started and reap in the benefits of being on the ever-growing social sphere! Good luck, we will be in touch with your next blog post! © 2016 Copyright Full Cream • Site by us.